In European Union (EU) law, we can find more and more references in different legal documents to non-legal concepts such as ethics and morality. A return to principles and values, inspired by Europe’s cultural, religious and humanist heritage, […] would imbue the integration project with meaning beyond the technocratic and the market, and might enhance the connection between the rule setters and the rule takers, i.e. the companies and citizens of Europe. René Smits, The Invisible Core of Values in the European Integration Project (Smits 2018, 221). In 2009, Williams has identified a “lack of ideal constitution for the EU”, as “values have not been taken seriously”27; hence, he addressed the question “whether an alternative philosophy, as a first step towards constructing a more just institution, can be achieved in the context of the EU and its current law”.28 He has also argued that although it might not be satisfactory, however, “some form of philosophy does exist”.29 Such a ‘philosophy of EU law’ can either be identified from within,30 or at the interface of law and philosophy, that is to say where EU law refers to non-legal concepts of ethics and morality (i.e. partly from the outside).31 Thus, the focus of this book is on the ‘import’ of non-legal concepts of ‘ethics’ and ‘morality’32 into EU law. In the following, this term of EU law comprises different ‘layers’ (in the sense of the hierarchy of EU law), which comprises EU primary law, EU secondary law, EU tertiary law, as well as, in between primary and secondary law, international agreements concluded by the EU33 (i.e. a vertical perspective34). From a horizontal perspective,35 in terms of different ‘areas’ of EU law, this book will mainly take into account the legislative output of the EU institutions (i.e. 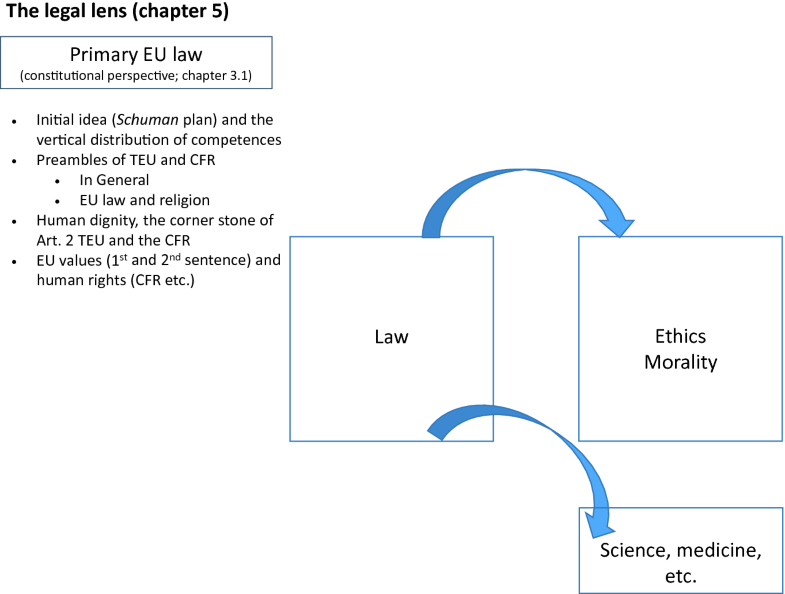 EU secondary and tertiary law). Due to the importance of the EU’s legal system, this book will also include the CJEU’s approach when dealing with ethics and morality. Beyond the legislative output, this book will also cover the question of ethics in law making concerning the sensitive issue of lobbying, as well as the ethical approach of the EGE in its opinions. 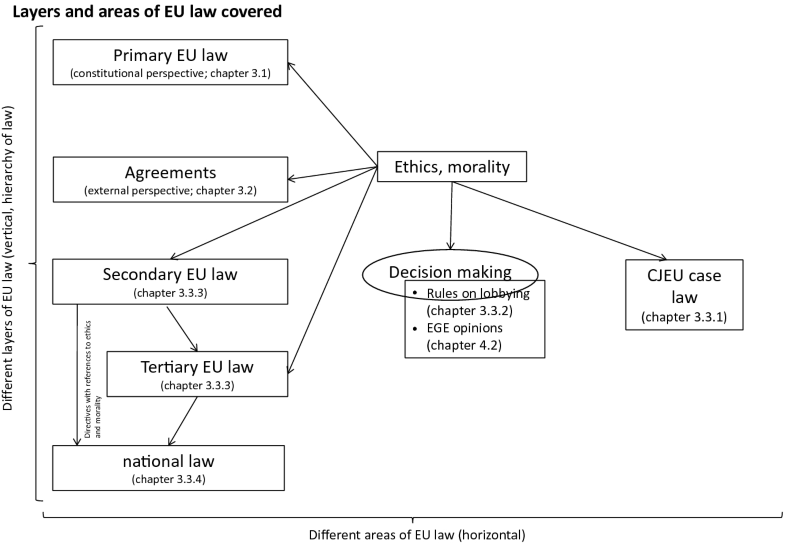 These different (vertical) layers and (horizontal) areas of EU law covered in this book are displayed below in Fig. 1.2. As this book will also look at this interface of law and philosophy from a legal lens,40 one important issue is the question, whether the references of legal texts to non-legal concepts are sufficiently determined regarding their content, so that the subject of law has enough information about the legal situation. In addition, looking at the different layers or areas of EU law, it will also be important to answer the question, of whether there is a common underlying pattern, i.e. if the references to ethics can be attributed to one (or more) particular normative theory(ies). First, are those references to ethics and morality determined in their content, or are they used without providing sufficient clarification (i.e. objective 1)? Second, when it comes to the implementation of relevant EU directives in national law, how have selected MS dealt with ethics and morality in the way they implemented these directives (i.e. objective 2)? Finally, can we identify a certain common horizontal (or rather a specific44) pattern in referring to these terms of ethics and morality, and can we thus identify an ethical spirit45 based on an analysis of these legal texts, or do we have to ascertain a gap, which has to be filled by other means (i.e. objective 4)? In EU law’s references to ethics, can we identify any philosophical theory at all (question No 1)? If yes, does this comprise one or more philosophical theories (question No 2)? 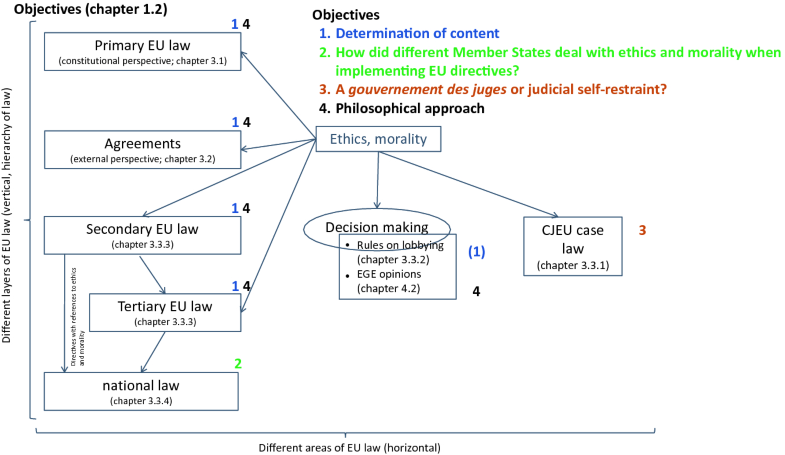 The relationship of these objectives to the different layers and areas of EU law covered in this book (see above Fig. 1.2) is visualized above in Fig. 1.3. It is clearly no objective of this book to create an inventory of all the examples of EU law, which reference ethics and/or morality. 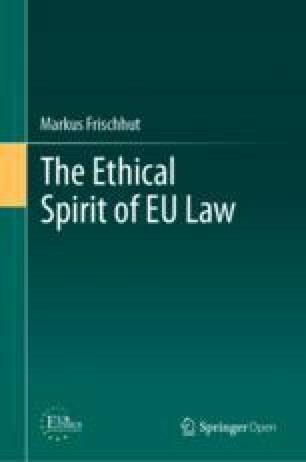 Based on a comprehensive empirical research (database research in EUR-Lex and other databases), the objective of this book is rather to answer the above-mentioned questions, especially if there is a coherent ethical spirit which, thus, can be identified in EU law. In order to guarantee a manageable scope and length of this book, certain limitations have to be emphasized. While the book will take a look at the law enacted by the EU47 institutions in the sense of EU secondary law (by the European Parliament [EP] as well as the Council of Ministers) and EU tertiary law (by the EC), it will remain in this legislative field from the perspective of Montesquieu’s48 ‘separation of powers’.49 While the judiciary (i.e. the CJEU) will briefly be covered in terms of relevant case-law, the administrative branch in the sense of all the policy decisions of the EU institutions (mainly the EC) will be clearly excluded from this book, as the amount of decisions and documents to be analysed would require one or several distinct book(s). Hence, the objective of this book is clearly not to cover any situation where EU law and/or policy have an ethical dimension or ethical implications, irrespective of whether there is a relevant EU document for this particular situation. The way in which these documents are applied by the competent authorities (at EU or at national level) is also beyond the scope of this book. This book will not analyse a possible clash of ethics and law, which could lead to a discussion, as it took place between law and justice. According to the Radbruch formula, for the sake of legal certainty, in principle “positive law, secured by legislation and power, takes precedence even when its content is unjust and fails to benefit the people, unless the conflict between statute and justice reaches such an intolerable degree that the statute, as ‘flawed law’, must yield to justice”.50 Radbruch’s formula was an attempt to challenge intolerable unjust law (for example, of the Nazi regime) by the principle of justice. Radbruch’s approach has to be seen against the background of legal positivism, whereby law and morality have been strictly separated.51 However, as the objective of this paper is to depict and analyse the status quo of ethics and morality in EU law, this challenging task can be left aside. One could also assess the ethical quality of any provision of EU law, even if it does not entail a direct (or even indirect) reference to ethics and morality. Such an analysis is also clearly beyond the scope of this book. When analysing EU legal documents referring to ethics and morality, this book will focus on these legal documents, which are still in force. Sometimes, EU law (e.g. Directive 2001/20/EC,55 now Regulation 536/201456 on clinical trials) foresees the establishment of ethics committees in the various MS. The work of these committees might have been initiated due to EU law, but is clearly beyond the objective of this book. When this book also takes a philosophical lens, this only covers ethics as one part of practical philosophy, while theoretical philosophy is not covered. Within ethics, this book focuses on normative theories, thus not on meta-ethics and applied ethics (see Fig. 1.4). Ethics and morality58 have not explicitly accompanied the EU integration process right from the beginning.59 Instead, we can rather identify a process of increasing references of EU law to ethics and morality since the 1990s.60 Hence, there is no pre-determined and explicitly stated philosophical theory of ethics in the EU, which could be applied to specific topics in a deductive way. 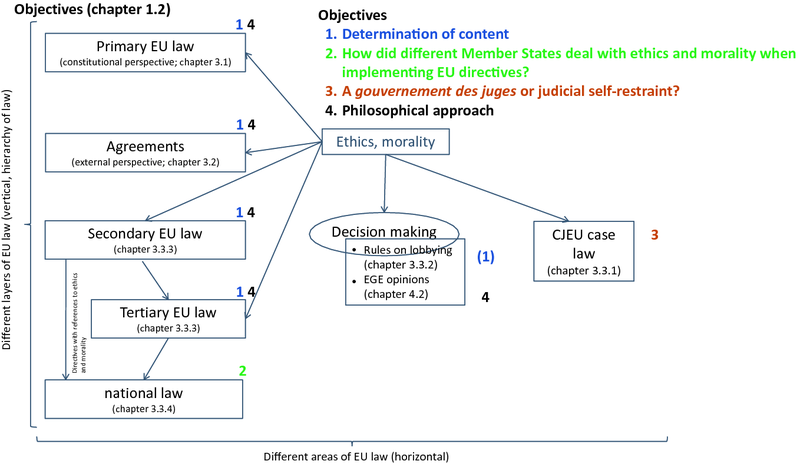 Thus, in terms of methodological approach, the above-mentioned research question (especially determination of content and possible identification of an ethical spirit of EU law) requires an indicative approach, evaluating the current situation of EU law in relation to ethics and morality, as it stands today. As lobbying (i.e. influencing decision-making processes) is a topic, which is often perceived by many citizens in a very critical way, the book will analyse, if there are both explicit, as well as implicit references to ethical or moral behaviour concerning both actors and targets of lobbying. In terms of implementation of EU directives (objective 2), the book will analyse, how those EU directives referring to ethics and morality have been dealt with by selected MS. Have those countries been more or less ambitious, and can we observe a similar approach in these countries? Concerning the case-law of the CJEU (objective 3), the book will address the question, if we can observe a ‘gouvernement des juges’, or rather a judicial self-restraint when dealing with ethics and morality in some sensitive fields (e.g. patentability of human life). By putting all these findings together, this inductive research will try to identify a general proposition, which can be derived from these specific examples. These findings will be analysed through two different lenses. First, these findings will allow to answer the question, if there is an underlying common normative ethical approach, and, if yes, if this can be referred to one (single or at least predominant) ethical normative theory (i.e. the philosophical lens). Second, these findings will also be placed in the legal context of the EU’s common values, human rights (CFR), human dignity, and the relationship of EU law and religion (i.e. the legal lens). After a definition of some key terms (Sect. 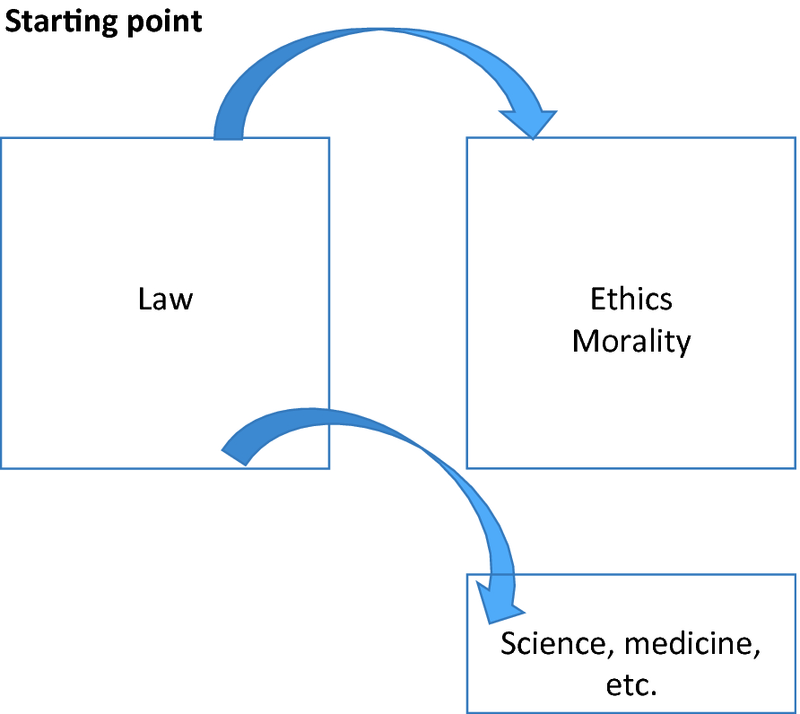 1.5), the book will start with a brief introduction of the three main theories of normative ethics, i.e. deontology, consequentialism, and virtue ethics (Chap. 2). The first theory rather focuses on an act, the second on its consequences, and the last one putting an emphasis on the agent itself.66 This will provide the necessary foundations for later (Chap. 4) putting the research findings into a philosophical (i.e. ethical) context. 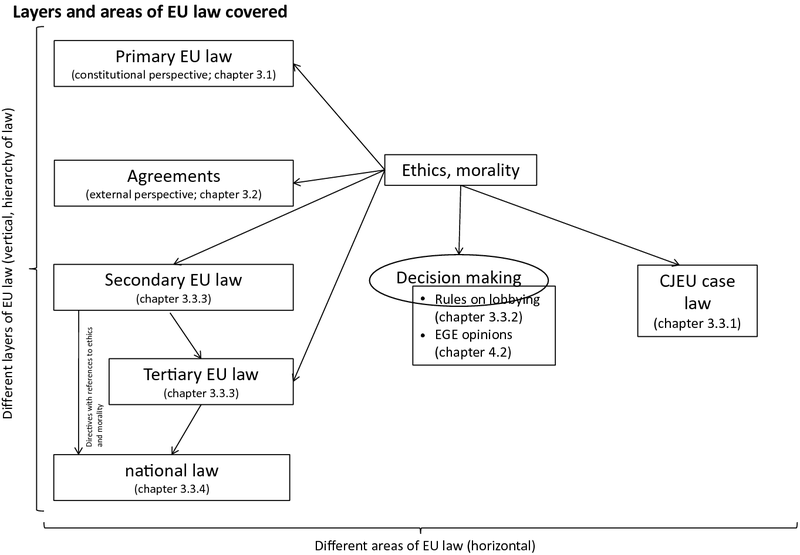 Taking a closer look at the different layers of EU law, this book will first focus on EU primary law (i.e. the constitutional perspective, Sect. 3.1), international agreements (i.e. the external perspective, Sect. 3.2), and EU secondary law (i.e. the internal law perspective, Sect. 3.3). The latter part will start with the question, whether in regard to the legislative and the judiciary branch of power (CJEU case-law) we can observe a ‘gouvernement des juges’, or rather a judicial self-restraint (Sect. 3.3.1). This internal law perspective will then cover the law-making process in the sense of ethics in lobbying (Sect. 3.3.2), before finally turning to EU secondary (and tertiary) law (Sect. 3.3.3). As EU secondary law also comprises EU directives (referring to ethics and morality) which have to be implemented into national law, also the different implementation approaches of selected MS will be covered (Sect. 3.3.4). Both the questions regarding the determination of content of EU law referring to ethics and morality (objective 1), as well as the related question as to how selected MS have implemented the relevant directives into national law (objective 2) will mainly be answered in Chap. 3. The same is true for the CJEU’s approach in this field (objective 3; Sect. 3.3.1). Based on these findings, the question concerning the ethical spirit of EU law (objective 4) will be addressed in Chap. 4 as follows. Section 4.1 will put all the findings (of Chap. 3) together and will relate them to the three main philosophical theories covered in Chap. 2 (i.e. deontology, consequentialism, and virtue ethics). As mentioned above, this includes the question of whether we can identify any normative ethical theory at all, and, if yes, if we can identify one or more theories (i.e. the philosophical lens). In the latter situation, the question will be if one of them is the predominant one. As can also be seen from Fig. 1.5, references of EU law to ethics and morality address the same question as in case of references to science and medicine. That is to say, the question whether these notions shall be imported in an unaltered way (i.e. absolute approach), or whether they shall be imported by placing them in the legal context (i.e. relative approach).68 This already takes us to the next chapter, the legal lens (see Fig. 1.6). Finally, these findings will also be analysed from a legal lens. Chapter 5 will include the EU’s values enshrined in Art 2 TEU, which have a high normative orientation function.69 As emphasized by Potacs, these values have to be taken into account in the interpretation of EU law.70 This part on the EU’s values71 will also include literature on the notion of the EU as a ‘community of values’ (Wertegemeinschaft).72 Furthermore, this chapter will cover human rights, with a special emphasis on the CFR. Within the different values mentioned in Art 2 TEU,73 a special emphasis will be put on human dignity,74 the corner stone75 of both the CFR and the values. 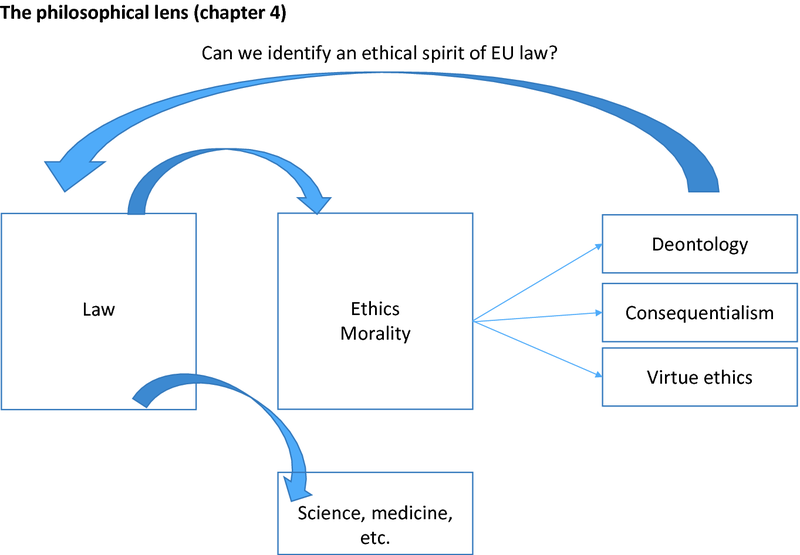 All of this together will help us to answer the question about the ethical spirit of EU law. In other words, as it was described elsewhere,82 the discovery of a common approach which can serve as a basis of understanding to the underlying philosophy of EU law. This shall help contribute to a better understanding not only of those legal documents referring to ethics and morality, but also for the rest of them. In its most familiar sense, the word morality […] refers to norms about right and wrong human conduct that are so widely shared that they form a stable social compact. As a social institution, morality encompasses many standards of conduct, including moral principles, rules, ideals, rights, and virtues. We learn about morality as we grow up, and we learn to distinguish the part of morality that holds for everyone from moral norms that bind only members of specific communities or special groups […]. Hence, in a very simplified way, one can say that ethics is the theoretical/philosophical approach to morality, where the latter refers to certain rules (“mores”) and formal85 codes of conduct in a specific (cultural, territorial and temporal) social system.86 At least, this is the standard terminology in philosophy. principles possess a deontological character ‘whereas values are teleological’. […] A sense of obligation attaches to principles whereas a sense of purpose is emitted by values, which ‘are to be understood as intersubjectively shared preferences.’ […] Values are therefore those ends deemed worth pursuing. Politically, they describe those qualities and states of condition that are considered desirable as shaping action or political programmes. The last term to be defined is ‘humanism’, which can be described as “any philosophical perspective that assigns preeminent value to human beings, their experiences, their interests, and their rights”.108 Humanism is a central notion for the EU, although a reference to humanism in an earlier version,109 in the end, has not made it into the preamble of the CFR. Having shed some light on these terms, let us now turn to the three main theories of normative ethics. A first step in this regard has been high lightened by Frischhut (2015). For an ethicalization of national private law and public international law, see Paulus and Schneider (2013). Fowkes and Hailbronner (2013, p. 395) even refer to a “global trend”. Vöneky et al. (2013, VI). For an intriguing overview of ethics committees, see Hermerén (2009). Herrmann and Rowlandson (2008); stressing different approaches in different Member States in this regard (p. 251). For another ethics advisory body, which recently issued an opinion on ethics and digitalization, see Ethics Advisory Group (2018). Busby et al. (2008), Mohr et al. (2012), Plomer (2008), Tallacchini (2015). Consolidated version: OJ 2016 C 202/389. Waluchow (2012, p. 193); “it can nonetheless be true that the EU and its Member States share a set of common values […] to which the EU Charter makes reference and which its authors intended to place front and centre in the minds of those required to exercise public power in accordance with its moral demands” (p. 194; emphases added). For simplicity’s sake, in the following, reference will always be made to today’s terminology; e.g. European Union instead of European (Economic) Community. In case fundamental rights have previously been decided as ‘general principles of law’, reference will also be made to the relevant provision of the CFR. On the EU courts, see infra note 21. In the explanatory notes to what is now Art 2 TEU, the ‘praesidium’ of the European Convention has also taken a broader approach (i.e. surpassing Art 2 TEU and also taking into account the objectives of Art 3 TEU, the CFR, etc.) when referring to “the Union’s ‘ethic’”; CONV 528/03 of 6 February 2003, p. 11. Consolidated version: OJ 2016 C 202/13. EC ‘A New EU Framework to Strengthen the Rule of Law’, COM (2014) 158 final 11.3.2014, p. 4 and Annex 1. Craig (1997, p. 467); “the clarity of the ensuing norm (was it sufficiently clear to guide an individual’s conduct so as to enable a person to plan his or her life, etc.)”. Addressing challenges of opening clauses against the background of legal certainty: Gruschke (2013, p. 42). This abbreviation refers to the Court of Justice of the EU in the sense of Art 19(1) TEU, which comprises not only the Court of Justice (CJ; this also includes the abbreviation ECJ), but also the General Court (GC). When in the following reference is made to the GC, this should be understood as also comprising the formerly Court of First Instance. CJEU judgment of 12 November 1981, Meridionale Industria Salumi, 212 to 217/80, EU:C:1981:270, para 10. See also Venice Commission, Report on the Rule of Law, CDLAD(2011)003rev, 10 et seq. ; and European Court of Human Rights (ECtHR) judgment of 29 April 2014, L.H. versus Latvia, 52019/07, para 47 (“the rule of law, which […] means that the domestic law must be formulated with sufficient precision and must afford adequate legal protection against arbitrariness”). This issue of responsibility and ethics in the life sciences is described by Jasanoff (2007, pp. 26–27) as follows: “A major function of policymaking for the life sciences is to create and maintain boundaries that correspond to people’s preexisting ethical and social sensibilities concerning the products of biotechnology […] politically significant boundary work also takes place in a multitude of more specialized forums that are less transparently in the business of boundary maintenance than legislatures or courts, such as expert advisory committees, parliamentary commissions, ethics review boards, and nongovernmental organizations”; emphases added. CJEU judgment of 12 July 2001, Smits and Peerbooms, C-157/99, EU:C:2001:404, para 92 (“what is considered normal according to the state of international medical science and medical standards generally accepted at international level”); see also paras 94 and 98. On an intriguing project of importing non-legal (medical) concepts in the legal sphere (VBE research group on ‘science and proven experience’, https://www.vbe.lu.se/) see Wahlberg and Persson (2017). As von Savigny (1951, p. 48) has emphasized in his book on legal methodology, every systematic approach leads to philosophy (“Alles System führt auf Philosophie hin.”). See infra Sect. 4.2.1; Busby et al. (2008, pp. 806–808), Frischhut (2015, p. 550). Williams (2009, p. 552) also states that “existing philosophy of EU law rests upon a theory of interpretation at the expense of a theory of justice” (no emphases added). “Perhaps the most important consequence of such a diagnosis is the evaluation that whatever else the ECJ may have done, particularly through its development of general principles, it has singularly failed to countenance ‘justice’ as a clear ethical commitment in its own right.” (p. 572). Williams (2009, p. 551); no emphasis added. For a philosophy of EU law based on EU integration itself, see Walker (2015), Williams (2009). On this ethicalization from outside versus an ethicalization form inside, see Gruschke (2013). This also comprises related terms, such as “ethical”, “moral”, etc. and, in the following, includes references to ethics and/or morality. In case of so-called ‘mixed agreements’, also by the MS. This vertical perspective concerns the hierarchy of EU law as such, but not the relationship of EU law in relation to the Member States; the latter issue will be covered in Sects. 3.1, 3.3.4 and 5.1 (see infra) of this book. For the application of the ‘separation of powers’ to the EU, see infra notes 48 and 49. CJEU judgment of 6 March 2018, Achmea, C-284/16, EU:C:2018:158, para 33 (autonomy with regard to both the MS and international law). CJEU judgment of 27 February 2018, Associação Sindical dos Juízes Portugueses, C-64/16, EU:C:2018:117, para 30. In this context, the CJEU also emphasizes the role of national courts: CJEU judgment of 25 July 2018, LM, C-216/18 PPU, EU:C:2018:586, para 50. This book will use the notion of ‘lens’ and not the one of ‘frame’ [also described as perspectives; Matthes (2014, p. 9)], as it often also has a negative connotation in the sense of being very selective and not putting an emphasis on facts; Wehling (2016, 43, 45). Lambert (1921, p. 8), with further reference to a US study from 1911. According to Montesquieu, Charles de Secondat, Baron de (1927, p. 159), “les juges de la nation ne sont, comme nous avons dit, que la bouche qui prononce les paroles de la loi”. Frischhut (2003, pp. 339–340), Rensmann (2005, 64–65). Theoretically, also objective 1 could refer to the CJEU; however, as we will see, in this case it is an integral part of objective 3. This question can be answered both with regard to different layers and areas of law (does the EU follow a different approach in EU secondary law, than for instance the CJEU in its case-law), or different sectoral policies (e.g. a different approach in the field of health, compared to the financial or technology sector). In CJEU judgment of 5 February 1963, Van Gend en Loos, 26/62, EU:C:1963:1, p. 12, the Court has referred to the “spirit” of EU law (the EEC Treaty at the time, more precisely), “the general scheme and the wording of the Treaty”, when identifying the principles of primacy and direct effect. However, Williams (2009, p. 561) emphasizes that this reference to the spirit was limited by also addressing the legal objective of the Treaty. This question (concerning the philosophical lens) is separate from the other question (concerning the legal lens) of whether these notions shall be imported in an unaltered way (i.e. absolute approach), or whether they shall be imported by placing them in the legal context (i.e. relative approach). While it is clearly beyond the scope of this book, it would be equally interesting to do the same research for the Council of Europe. Montesquieu, Charles de Secondat, Baron de (1927, pp. 152–162). While the EU is clearly not a nation state and accepting that there are certain differences when applying this state related concept, we can still use it to differentiate the legislative from the administrative and the judiciary branch. Hart (1994, p. 268) put it this way “I argue in this book that though there are many different contingent connections between law and morality there are no necessary conceptual connections between the content of law and morality: and hence morally iniquitous provisions may be valid as legal rules or principles. One aspect of this separation of law from morality is that there can be legal rights and duties which have no moral justification of force whatever”. Concerning rules on lobbying (infra, Sect. 3.3.2), also implicit references will be taken into account. Such an implicit approach has also been observed by Tallacchini (2015, p. 166) with regard to nanotechnology. Concerning the CJEU (e.g. references to ethics addressed by referring national courts in preliminary ruling procedures, respectively the EC in infringement procedures, Advocates General, or the CJEU itself), see at the beginning of Sect. 3.3.1.1. Directive 2001/20/EC of 4 April 2001 on the approximation of the laws, regulations and administrative provisions of the MS relating to the implementation of good clinical practice in the conduct of clinical trials on medicinal products for human use, OJ 2001 L 121/34, as repealed by ‘Regulation clinical trials’ (=note 56) [Directive clinical trials]. Regulation (EU) No 536/2014 of 16 April 2014 on clinical trials on medicinal products for human use […], OJ 2014 L 158/1, as complemented by OJ 2017 L 238/12 [Regulation clinical trials]. On the ethicalization of public international law see Vöneky (2013). On the terminology, see infra Sect. 1.5. For instance, there are no explicit references in the European Coal and Steel Community Treaty. However, the issue of values and fundamental rights has already been addressed even before the formal integration into the EU treaties; e.g. Hallstein (1979, 66–71 and 71–72). According to Calliess (2004, p. 1034), values—as part of the “magic triangle of values” (i.e. peace, economy and integration; own translation)—have been part of the integration process from the outset. See supra at note 26. Partially also Spanish and Italian. Busby et al. (2008, p. 834). This role was criticized as “ambiguous”; Busby et al. (2008, p. 842). The opinions of the EGE were coded with the aim to derive ‘rules for prediction’ in an explorative way, using a latent analysis, in order to focus on the structural meaning of these opinions. The software MAQDA has been used by the research team in order to thoroughly analyse the EGE’s opinions; see infra Sect. 4.2.2. Cf. Louden (2012, p. 504). N.B. The two arrows pointing to the right refer to references of law to non-legal domains, whereas the arrow on top addresses a different question. For law and science, a relative approach has been preferred; Frischhut (2017, pp. 71–72), Wahlberg (2010, 208, 213; 2017, p. 63), Wahlberg and Persson (2017). Di Fabio (2004, p. 3). We have to accept that values do not only have a legal meaning, but also a philosophical one; cf. e.g. Scheler (1916). E.g. Mandry (2009), Reimer (2003), Rensmann (2005), Schmitz (2005, 80–85), Sedmak (2010, pp. 9–19). Another question to be answered is the different meaning of the first in relation to the second sentence of Art 2 TEU. In literature, human dignity has been described as a deontological concept; Düwell (2017, p. 182). According to Art 31(2) Vienna Convention on the Law of Treaties (United Nations, Treaty Series, vol. 1155, p. 331) the context for the purpose of the interpretation of a treaty also comprises, amongst others, its preamble. I.e. especially recital 2 of the CFR preamble (“spiritual and moral heritage”, “indivisible, universal values of human dignity”), as well as recital 2 of the TEU preamble (“cultural, religious and humanist inheritance of Europe”, “universal values of the inviolable and inalienable rights of the human person”). Cf. Meyer (2014, pp. 70–73). Consolidated version: OJ 2016 C 202/47. The author would like to thank Johan Brännmark (Lund University | VBE research group; see note 24) for sharing these thoughts. Beauchamp and Childress (2013, pp. 2–3); no emphasis added. The author would like to thank Lena Wahlberg (Lund University | VBE research group; see note 24) for valuable feedback in this regard. See also infra Sect. 3.1.1. CJEU judgment of 11 March 1986, Conegate, 121/85, EU:C:1986:114, para 14. Funke (1971, 1972, 1973, 1974, 1975, 1976, 1977, 1978, 1979, 1980, 1981, 1982, 1983, 1984, 1985, 1986, 1987, 1988, 1989, 1990, 1991, 1992, 1993, 1994, 1995, 1996, 1997, 1998, 1999, 2000, 2001, 2002, 2003, 2004, 2005, 2006, 2007, p. 812). CJEU judgment of 17 April 2018, Egenberger, C‑414/16, EU:C:2018:257 (ethos of church as employer and recruitment); CJEU judgment of 11 September 2018, IR, C‑68/17, EU:C:2018:696 (similar case, but on dismissal). The author would like to thank Nils-Eric Sahlin (Lund University | VBE research group; see note 24; member of the EGE) for valuable discussions concerning the legal versus the philosophical understanding of this notion of ‘principle’ (in the context of the precautionary principle/approach) during a workshop on 3 May 2018 in Lund. On principlism, see infra Sect. 2.4. For a detailed analysis of this term, see Hermerén (2015). The author would like to thank Lena Wahlberg for addressing the issue that sometimes also values need to be balanced against each other; hence, what we ought to do can depend on the balancing, the situation, the decision rule, etc. Williams (2009, p. 559); see also Williams (2010, pp. 256–257). Reimer (2003, p. 209). See, for a similar analysis with regard to human dignity, Advocate General (AG) Stix-Hackl opinion of 18 March 2004, Omega, C-36/02, EU:C:2004:162, paras 84–85. On virtue ethics, see infra Sect. 2.3. MacIntyre (1981, p. 227). Also adopting this definition: Williams (2010, p. 257), who furthermore points out that these three notions of values, principles and virtues “can and do overlap”. Klein (1971, 1972, 1973, 1974, 1975, 1976, 1977, 1978, 1979, 1980, 1981, 1982, 1983, 1984, 1985, 1986, 1987, 1988, 1989, 1990, 1991, 1992, 1993, 1994, 1995, 1996, 1997, 1998, 1999, 2000, 2001, 2002, 2003, 2004, 2005, 2006, 2007, p. 695). CONV 722/03 of 28 May 2003, p. 2. Ethics Advisory Group. (2018). Towards a digital ethics: Report by the Ethics Advisory Group established by the European Data Protection Supervisor, the EU’s independent data protection authority. Retrieved from https://edps.europa.eu/sites/edp/files/publication/18-01-25_eag_report_en.pdf. Radbruch, G. (2006). Statutory Lawlessness and Supra-Statutory Law (1946): Translated by Bonnie Litschewski Paulson and Stanley L. Paulson. Oxford Journal of Legal Studies, 26, 1–11. https://doi.org/10.1093/ojls/gqi041.